Bicycles are very usefull in Amsterdam. Trams and buses ride on the main roads. 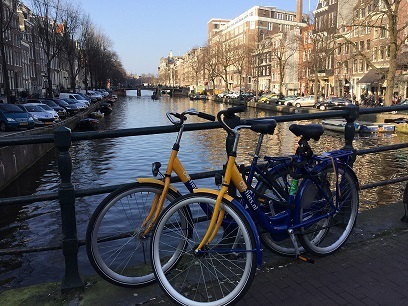 If you rent a bicycle it is easy and fun to discover Amsterdam and cycle along the canals. Allmost everybody in the Netherlands has a bicycle. Sometimes your property in Amsterdam is renting bikes. If it’s not then a good choice is the bike rental at Central Station. At Central Station is a supervised bicycle storage area. Here you can rent a bicycle. For a simple model you have to pay a deposit of €50. The deposit of an electric bicycle is €150. Allways lock your bike carefully because many bicycles are stolen in Amsterdam. OV is ‘Openbaar Vervoer’ in Dutch language; it means ‘public transportation’. It has some good advantages to rent such a OV-bike but for most tourists it’s not an option. You must have a subscription and it takes a few days to get your own OV-identycard. Renting an OV Bicycle has several advantages. The rental price is lower, the payment is afterwards by bank and you don’t need to give a deposit.